I’ve been working on a book since October and just clicked that fabulous little “send” button to ship the manuscript off to my editor. That is one of the two instances when an author can breathe for a moment. The other is when you click the “publish” button. Sigh. 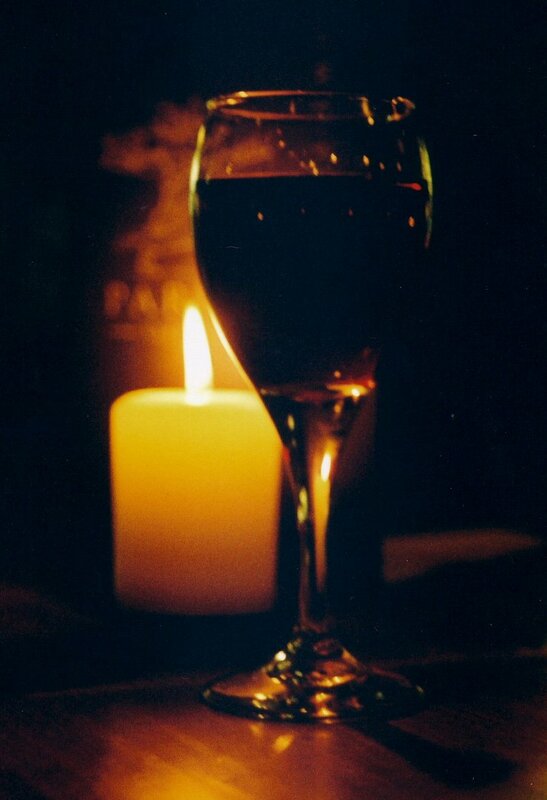 Every time I reach either moment, I am reminded of the movie, “Romancing the Stone,” where Kathleen Turner places a five-inch thick, type-writer written, finished manuscript on her kitchen table, lights a candle, and pours herself a glass of wine. Maybe that is why I’m tempted to open that bottle of Crown Royal sitting in my cabinet. But do I relax and bask in the glow of the finished product? No, of course not. 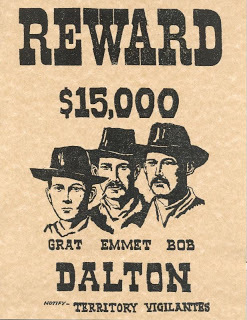 I’ve spent the last four hours researching the Dalton Gang for my new book. But, hey, I’ve learned a ton about the Dalton Gang today! What I found interesting about them is they did not set out to be outlaws. They were all initially U.S. marshals. There were four brothers in the gang. One lived in California on his successful farm with his beautiful wife. His name was Bill, and he is not in the above Wanted Poster. I assume his wife wouldn’t let him go that day. Anyhoo, he was involved in politics, and the local farmers were trying to keep the railroads from running through their farms. When his three brothers (the hotties pictured above) showed up, their manly testosterone levels escalated, and they came up with a plan to teach the railroads a thing or two. They attempted to rob a train, but being inexperienced, bumbling train robbers, the result was a total fiasco. They fled empty handed under gunfire. Somewhere between that humiliating failure in 1890 and their terrible deaths in 1892 while trying to rob TWO banks – across the street from each other – at the same time – in broad daylight – which resulted in a shoot out – and most of the gang dying, their fine morals and upbringing obviously went astray. Boys will be boys. The photo above is from Wikipedia. The middle two are Bob and Grat. (Emmett did not die that day, but he was shot over 20 times, survived, and spent 14 years in prison.) 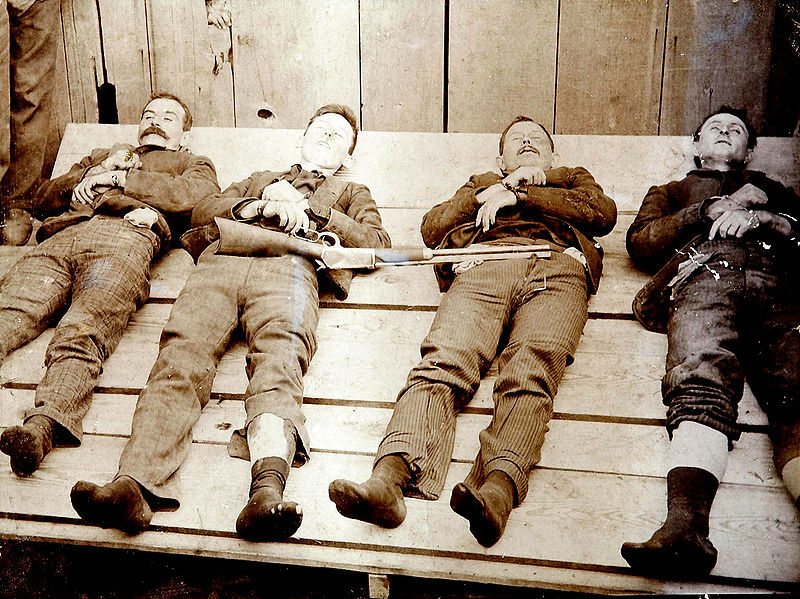 These boys were killed in the 1892 shoot out. Their boots were removed. They are all in handcuffs. Who took their boots?? And why are they handcuffed?? And what’s up with the gun in the photo?? So, they had a town photographer, but no town doctor to know if they were dead or not, hence the handcuffs?? Anyway, the book is not about them, it only starts with them. But I’ve had an interesting day researching them nonetheless. This entry was posted in "The Legend of Stuckey's Bridge", historical fiction, life, Mississippi, observation, research, writing and tagged life, observation. Bookmark the permalink. Oh the joys of researching 🙂 reminds me of a recent afternoon when I got totally stuck in the sad story of the Mayerling drama 1889 starring handsome Austrian Crown prince (Rudolf) and his oh, so young mistress (she was 17) Marie. Anyway, unlike you I don’t even have anywhere to use all this info, my books being set in the 17th century…. Thanks to you I now know much more about the Daltons than i did before – not sure I find them “hotties”, though. Thought you would … And hey, at least we make interesting conversation partners, right? Interesting question about the handcuffs, as though their fatal shots were given after being in custody. The gun was probably a dramatic flair from the photographer. Great post, I love researching history myself. All accounts say they were killed in the shoot out. I think people in those days weren’t quite sure if someone was dead or not, so they didn’t want to take any chances, or perhaps the handcuffs were for dramatic flair also.